So, what's new in Path to Pandora? You can only play one account per round in Travian, but we still want you to be able to see all this amazing new artwork. The Game Design team has therefore decided to change the basic mechanics of conquering and make things more interesting. When you conquer another tribe's village in Travian: Path to Pandora, the village will not change tribe type, except for the Natars (see below). Let's see how this works with a visual example. As you can see, if you have a Hun account and conquer a Gaul village, and if the defender built a Trapper, you will find it in that village (the only building that will not stay are the Walls, like in Travian: Legends). What else happens? You won't be able to build the specific building for the Huns in this village, since the village belongs to the Gaul tribe. You'll be able to train Gaul troops, chieftains and settlers. If you send your settlers from that village to settle a new one, the new village will also be Gaul. If you send your chieftain from that village to conquer another village, the conquered village will not switch tribes. If you send your chieftain from that village to conquer a Natar village, the conquered Natar village will change to the Gaul tribe. Your hero will always belong to the account tribe, so in this case he will always a Hun. If you send the hero to the Gaul village you conquered and make it his new home, your hero bonus will affect the Gaul troops if sent with them on reinforce, raid or attack. What's more, if the hero wears Gaul troop items, these will also affect the troops. If the home village of the Hun hero is a Gaul village, the hero can find Gaul troops when sent on adventures. Since the hero belongs to the Hun account and will always be a Hun hero, he will only find Hun weapons on adventures. Troops from different tribes belonging to the same account CANNOT be merged. 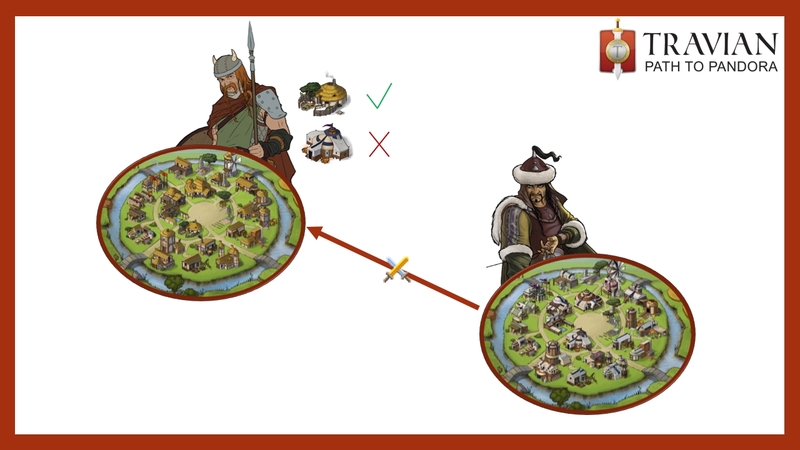 In Travian: Path to Pandora, we changed how confederacies work. You are only able to have a confederacy comprising four alliances, which have to be connected with each other. Alliance A and Alliance B may create a confederacy; one of them will send the request to the other, and the other will accept. This works the same as in Travian: Legends. At this point, Alliance A wants to also have Alliance C in the confederacy; the confederacy request needs to be sent by both Alliance A and Alliance B, only then will Alliance C be able to accept. With the new system, you can only send resources and troops to your own account, alliance or confederacy. The public offers in the marketplace are still available for everybody unless you check the "own alliance only" option. In this case, it will still only be available for alliance members. In Travian: Path to Pandora, we will remove the "Plus" statistics and replace them with a new system that provides the player with more insights. This system will be free and available to everyone in their account. On the statistics page, you will find a new tab called "General" with tons of information that we hope will help you to manage your account. This information is only available to people who have access to the account, including sitters. In Travian: Path to Pandora, you can use one artwork every 24 hours (same as the bucket). In Travian: Path to Pandora, the standard has to be changed to also work with the confederacy. The construction costs of the Egyptian Waterworks have been increased considerably to improve the balancing. Alliance bonuses To make the alliance bonuses more useful and players more willing to donate, we have changed the bonus for Philosophy and Commerce and decreased the cost for the first 4 steps. The culture point production bonus is increased from 2% to 4% per level. Merchant capacity is increased from 20% to 30% per level. This wraps up the main features for Travian: Path to Pandora. For summary regarding all changes, please refer to the Feature Comparison page.